It’s still morning somewhere… Lot’s of things happening that we think are worth your mental energy this week, including original reporting from Olympia, Seattle, and some curated items for you across the state. As always, thanks for reading our stuff. 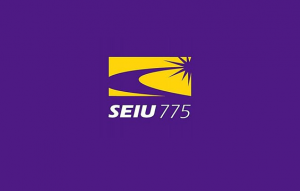 Last week, David Rolf announced he was termed-out of office as the head of SEIU 775. Sterling Harders was selected to replace him. Rolf has made friends and enemies over the last 18 years. Friends find him warm and passionate. Enemies found him strategic and strong. I would bet he’s earned the respect from almost everyone that has worked with him or against him. It’s not an overstatement to say that Rolf is one of the most important political figures of progressive politics in the country over almost the last two decades. He ran the campaign that created SEIU 775, Washington State’s largest union and most dynamic progressive economic force. As Andy Stern’s lieutenant, he was part of the team that changed the AFL-CIO to focus on organizing and growth in the digital age. With Nick Hanauer, he was a central player in the $15 minimum wage strategy as a city-first, outside-in strategy to change the national conversation on wages. While he’s leaving SEIU, don’t expect him to go away. Whatever he does next will likely continue to have national reverberations, and direct political impact in Washington State. The recently released Economic Review shows Washington remained strong on jobs and trade in the second quarter. The state posted solid job numbers, with 19,600 more jobs created than originally forecasted, while personal income and trade also grew. Both are indications of strong economic progress. The report also provided glimpses of stats to peak concern. Constructions jobs were down and residential building permits declined, perhaps evidence of long prophesied cooling housing market. The second quarter spike in exports came just before the recent trade tariffs went into effect, leaving questions as to whether gains can be sustained through the end of the year. Emily Boerger joined our team at the Washington State Wire a year ago after earning a graduate degree in Science Journalism. Though she hadn’t anticipated covering local politics when she graduated, she’s found that many of the reasons she is passionate about science writing, apply to state politics as well. Yesterday, Laura Zaichkin announced she was leaving her role as Deputy Chief Policy Officer at the HCA. She was one of the primary executive sponsors of implementing the 1115 waiver, and for the organization of the ACH initiatives. With Zaichkin’s departure, the HCA lists 26 people as executive leadership at the agency. 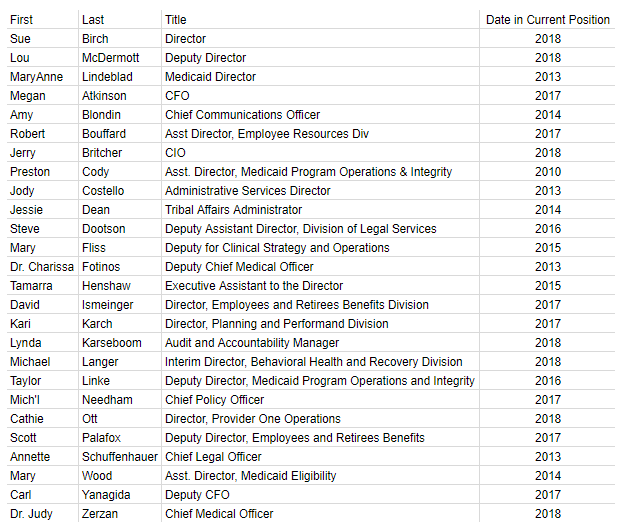 Of those, more than half (14) are new to the agency or new to their current position since 2017. More than one quarter (7) are new to the agency or to their position in 2018. With Zaichkin’s departure, and Nathan Johnson and Dorothy Teeter’s before that, it’s not clear which executive is the lead sponsor of the waiver’s ambitions, particularly those related to the ACH initiative. Under the state’s 1115 waiver, if the HCA doesn’t meet critical benchmarks, it will lose federal funds already awarded for the next three years. The Legislative Task Force on Public Records held its first meeting last week in Olympia. The task force was created following public outcry after lawmakers’ quick passage of a billremoving the legislature from scope of the Public Records Act. During the Wednesday meeting, the 15-member task force participated in a facilitated discussion in which key concerns and themes emerged. Sen. Randi Becker mentioned her concern for constituent privacy, several task members worried about the administrative workload required to respond to legislative records requests, and Toby Nixon, President of the Washington Coalition for Open Government, brought up concerns related to the dispute resolution process. You can watch the entire meeting here, or read our coverage of the highlights here. Dino Rossi is running a TV ad hitting Kim Schrier for not taking enough kids covered by Medicaid in her pediatric practice. Whether the ad is effective, I don’t know. What strikes me as interesting is that something commonly accepted inside the health care industry – that doctors have to limit their Medicaid exposure – is portrayed as uncommonly negative in the political world. It shows the gap that continues to exist between the realities experienced in health care and those in politics. Marjie High explores the context of the ad in a piece here. She points out that Rossi’s support for rolling back the ACA will create similar – perhaps more – hardships on kids and families. Eliminating the ACA’s premium subsidies hits middle class families the hardest. Repealing the ACA also allows underwriting and issuance discrimination based on pre-existing conditions, which has sometimes included being a woman. On the request of Sen. Mike Padden, Senate Committee Services staff released an update on the State Senate’s remote testimony pilot program. During the 2018 session, 9 of 14 senate committees utilized remote testimony. Of the 21 completed remote connections, there were 3 that had minor technical issues but there were zero failures. This is an improvement from results in the 2017 session where 7 committees utilized remote testimony and there were 7 technical issues and two system failures. The Seattle Storm have taken the first two games in their quest for their third national championship. It’s been an amazing playoff run, with come from behind wins and at least one broken nose. There is still a lot of sexism in sports and the politics of Seattle sports, in particular. While there is energy around a renovated Key Arena and the prospect of NBA and NHL teams coming to the state, we should all take tremendous pride in the class, effort and achievement of this team. Sue Bird may be the face, the but the owners of this team do our community a tremendous public service by building a successful franchise in Seattle. From a dad with daughters, a son with a mom, and a husband with a wife, thanks for all of your work, Storm. Now, go win! Cathy McMorris Rodgers’s office tells us that the aftermath of Hurricane Florence has everyone on “standby just in case things start shutting down.” South Carolina is calling for the mandatory evacuations of 1m people along the coast. Freeways will only be open one direction – meaning both sides of the freeway will be heading west for anyone able to drive away. Imagine a mandatory evacuation out of central Puget Sound. It would be chaos, with all traffic lanes likely at a stand still. 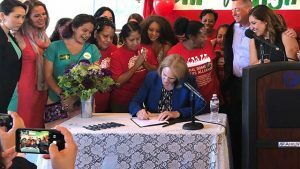 I’m reminded of our interview with then-candidate Jenny Durkan on Seattle’s emergency preparedness. “It’s not good news” she told us in 2017. I doubt it’s gotten appreciably better in the year since that comment.